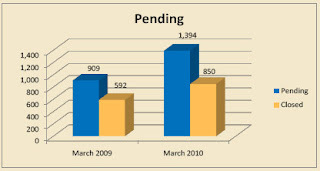 Pending home sales surge in the Naples area for the first quarter 2010. The figures hasv been just released by the Naples Association of Board of Realtors. 1679 contracts in Q1 2010. 957 contracts in Q1 2009. The improvement is now noticeable in all price's ranges. The number of pending sales doubled for condominiums in the $1M to $2M segment. In March 2010, the sales in Naples Beach area (34102, 34103, 34108) - area including Olde Naples, Coquina Sands, The Moorings, Park Shore, Pelican Bay and Vanderbilt Beach beach increased 85%!